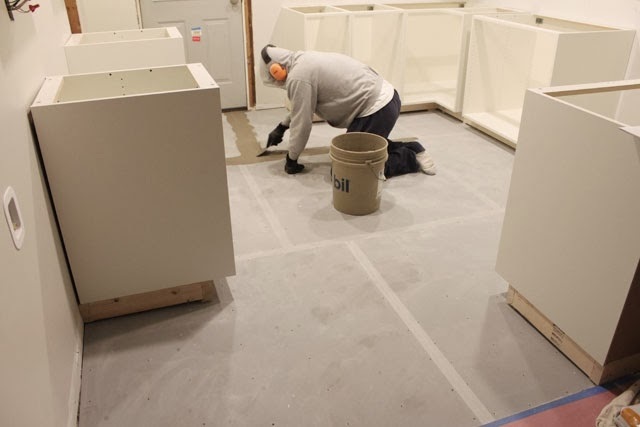 After the bases were built and attached to the flooring, we could begin the tile. Mike first had to do some prep work to the denshield. He taped all the seams and I mixed some mortar for him and he essentially "sealed" all the seams with mortar. I'm not sure that this is a completely necessary step, since sometimes Mike is a little crazy, but he said it was so we did it! Since we work on the kitchen only after work and on the weekends, doing things like this that require 12 hour dry time isn't so bad. (It also explains all the night photos). Mike and I did this on a Friday night, and Saturday we ran errands, had plans with some friends, then picked up our tile and supplies. 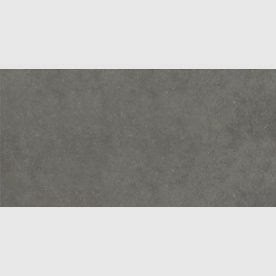 We went with the 12"x24" gray porcelain tile from Lowe's that I mentioned in our kitchen mood board. 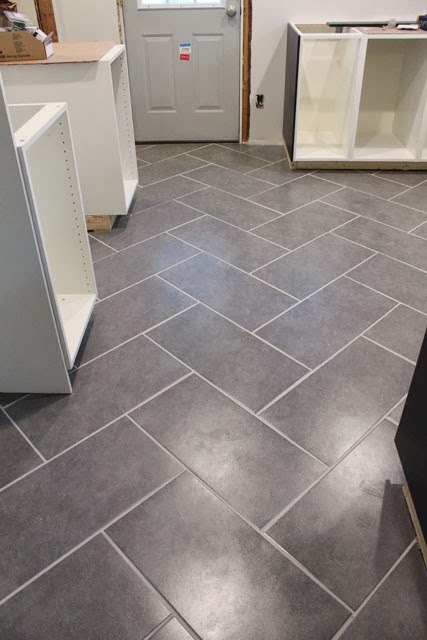 I didn't get photos while the tile was going in on Sunday, but Mike cut the tiles for about half of the room. Since I wanted a herringbone pattern there were a lot of diagonals. I drew out the pattern and it helped, because no matter how many rows he had done, we both still got confused trying to guess which way a tile would have to be cut sometimes. 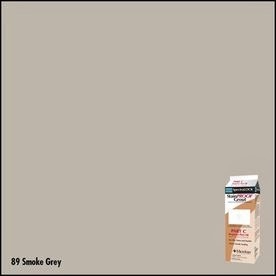 I chose an epoxy grout, SpectraLOCK, that used a 3-part system, in 'Smoke Gray'. The bucket with A & B in it runs around $22, while the sand part C is $3 or so. Making it around $25 a bucket. We bought 3 buckets thinking that would be more than enough. Around 1 am on Monday night (Tuesday morning?) this is what we had left. Don't you hate when that happens?! Mike grabbed another bucket and sand mix on the way home from work the next day, (actually 2 of each - we weren't taking the chance of running out again), and we had everything finished that night and ready to be walked on the next morning. I mixed each bucket, and the buckets come with a sponge, gloves, and parts A & B. One bag looks like vegetable oil and the other looks like Elmer's glue. You mix those together and then add part C which is really fine colored sand. It's like the sand you layered in crazy little bottles as kids. 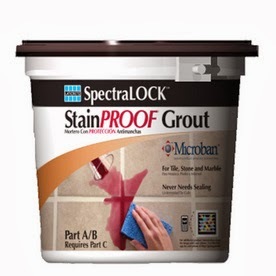 You get about 3-4 cups worth of grout. It's not really fluid and was harder to work with than the polyurethane we used in the bathroom upstairs. It was a lot lighter than I expected, but dried a little darker, (still lighter than I had planned), but I actually love the color and am glad it turned out so light. The benefit of epoxy is that there is no need to seal it and it's stain proof. 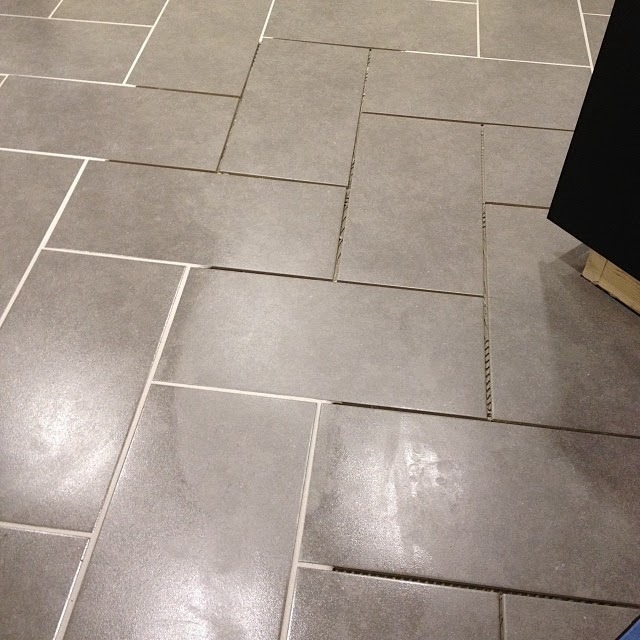 We obviously haven't put it to the test, but it's a really nice looking grout so far. We have to remove a little of the haze, but I like doing that after the rooms done so that I don't worry when something else gets it all dirty. As you can see from the photo, we've already started attaching panels and will finish adding those, then the doors and drawers!